NRICH was delighted to work with Haringey Council again on a five-term project from January 2014 to July 2015. 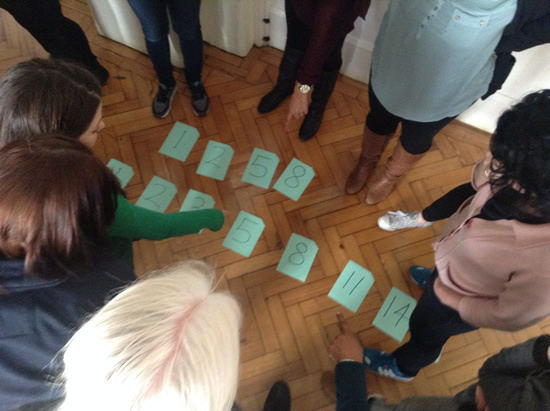 The project, funded by the London Schools' Excellence Fund, aimed to improve primary teachers' Maths subject knowledge and pedagogic knowledge, thereby increasing pupil attainment. Liz Woodham, one of the NRICH Primary Coordinators, led the project with Michael Hall, an independent consultant and part-time lecturer at the Open University, who has worked with Liz on previous projects in Haringey. 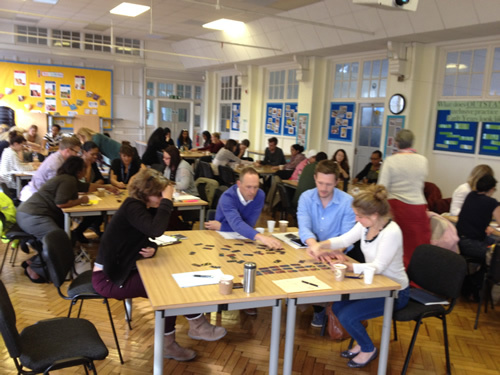 Two primary teachers from each of approximately twenty schools in Haringey attended ten face-to-face sessions. This page is intended to be an information-sharing point. We played Totality all together and discussed the mathematics we used, and its 'low threshold high ceiling' nature. Michael referred to a report 'Development of Maths Capabilities and Confidence in Primary School' by Nunes, Bryant, Silva and Barros (2009) which you can download here. Another very interesting read is EffectiveTeachersofNumeracy.pdf. We didn't make reference to this report today, but are likely to do so throughout the project. Michael also referred to this article in Primary Mathematics (published by The Mathematical Association) which is about a previous project between NRICH and Haringey. 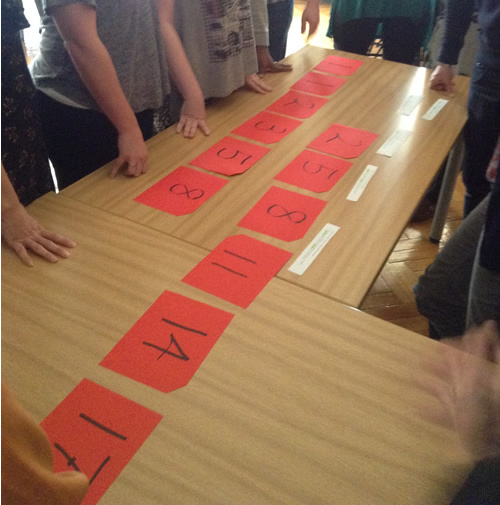 Five participants stood up and flipped the cards until a mix of odd and even numbers were displayed. Without seeing the numbers displayed, Michael asked how many are odd and then announced the total of the five numbers. He repeated this several times. The challenge is to explain how he knew the total. The magic of maths is understanding the structure, design and presentation of the activity. - you may wish to begin a learning log to record interesting moments that you notice in your classroom (brief extracts of what children say are worth noting for reflection and discussion). During the day the tasks we tried all focused on developing children's number sense and understanding of place value. They can all be found in the Number Sense and Place Value Feature. Liz mentioned research by Kenneth Ruthven which suggests a model for teaching mathematics: exploration -> codification -> consolidation, rather than a 'show then practice' model found in some mathematics lessons. Although the context is secondary mathematics, this feels very relevant for primary too. You can read the paper, published in Educational Studies in Mathematics 20 (1989) here: ExploratoryTeachingKRuthven.pdf. As the above image is rather difficult to read, the text is in this document too. We had a brief discussion about the completed pupil questionnaires, which Michael and Liz collected and we also talked about what it had been like doing the subject audit. - read chapters 5 and 9 of Listening Counts and identify a couple of children to focus on. (The reason for selecting them in particular is completely up to you e.g. they say very little; they are girls and you suspect they are underperfoming; they are high attaining but find application of knowledge difficult - it could be anything!). Begin to jot down observations and thoughts about these children in your learning log. - try out a rich task with your class and be prepared to chat about how it went. Day 3 focused on recording mathematics. We had a go at School Fair Necklaces and used this activity as a springboard from which to discuss working systematically as well as aspects of recording. Later in the day, we tried The Amazing Splitting Plant, which lends itself to a variety of different ways of recording. 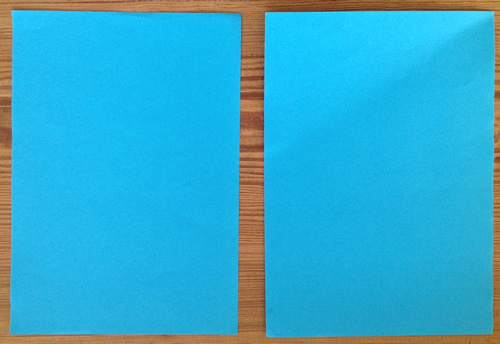 Emma and Marie from Bounds Green very kindly brought some of their children's maths books to share with us, which contain plain white pages rather than squares. We discussed the pros (e.g. freedom to record in any way children like) and cons (e.g. some cutting and sticking needed when task does need other types of paper). Emma/Marie were very enthusiastic about the books. Children seem to enjoy the tasks - why? We discussed chapters 5 and 9 of 'Listening Counts' and how reading them made us feel. It was suggested that chapter 5 could be worth sharing with colleagues back at school. We recognised that many teachers feel the pressure of 'coverage'. Could whispers be written on post-its? 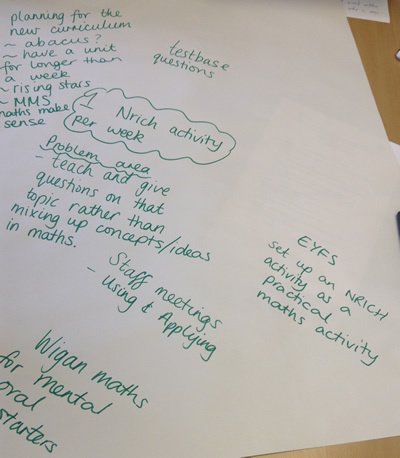 One participant described how she uses pupils as 'learning detectives' - a couple volunteer (or are chosen) to listen in on conversations as others work on maths and report back. The idea is then to devise a similar set of cards with a different question to be answered. Questions with surplus or missing data. Liz shared a ppt animation focusing on halving, featured in the teachers' resources section of Halving, and we then tried the task itself. We also had a go at Fair Feast. 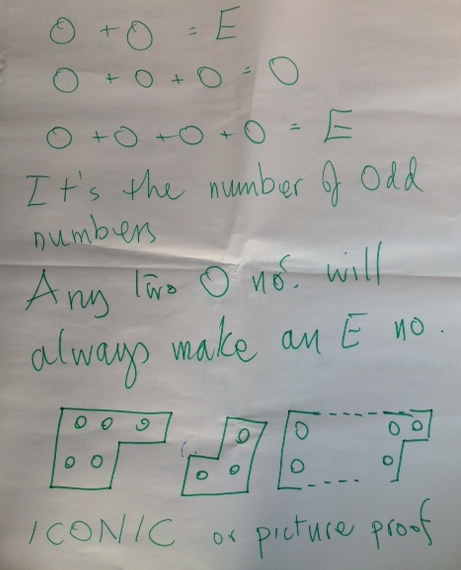 One participant described using this problem with her Year 2 class very successfully. She had intended it as a short task, but it ended up taking quite a bit of time as the children were engrossed and didn't find it quite as straightforward as she'd anticipated. Liz flagged up the Fractions Feature on NRICH which contains the article mentioned above as well as the activities and more. We spent some time composing reflections on the project so far, which were sent to Michael/Liz. Michael then led us in some paper folding which linked well to the Halving animation in the first session. 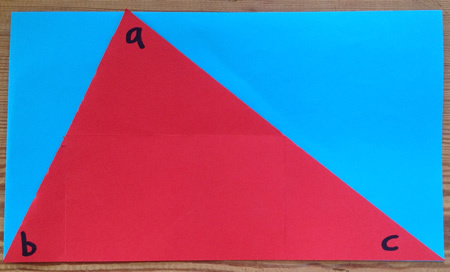 We created a square from an A4 piece of paper, then folded in half and half again, and half again ... We unfolded after each stage to count the triangles we had created. “Very good, bear,” said Ronnie Playfair approvingly. “No, thank you, Mr Playfair, “said Paddington firmly. “In that case ... I must ask you for the £5 back, the answer is one foot”. “Not if you’re a bear,” said Paddington, remembering his efforts at carpentry in the past. Bond, M., 1971 Paddington at Large: Collins, London. 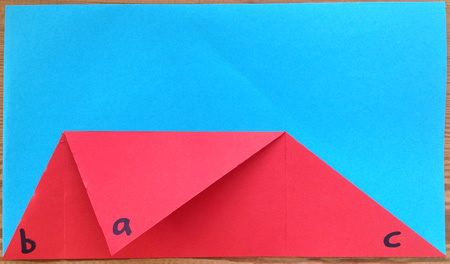 With A4 paper we folded as Paddington did and cut one strip out to fold the 'other' way. Then we asked, 'what if the strip is one metre in length?' and so on. With a second strip we tried folding into three equal parts and discussed why it is more difficult and how it generalised folding into n parts. Finally, we linked to mental calculation and finding fractions of an amount by asking what length of strip would suit three folds and n folds. Finally we used another strip which we assumed to be 36cm in length and rolled two dice to find fractions of 36. Discussion centered on how to work out the fractions that seemed difficult and why they were difficult. 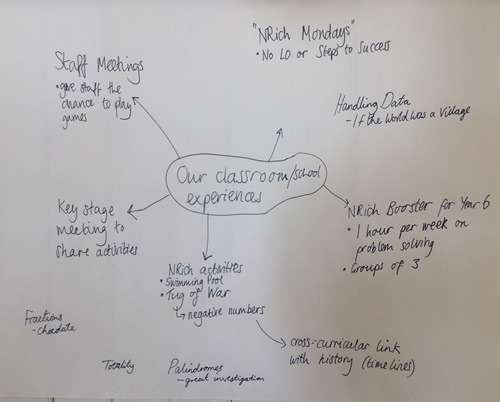 Later in the day, we spent some time discussing chapter 4 of 'Listening Counts' and began to think about outline plans for a staff meeting back at school in the autumn. Michael led two more mathematical activities. The first of which started with the description of a dad who was cutting a cake in half to share between his two children. The question is, did he actually cut it in half? What fractions might he have created? This led to trying to state fractions nearer and nearer to a half which weren't a half exactly. Michael also reminded us of the counting stick and how it can be used to count in fractions and links with decimals - great for chanting and mental work. 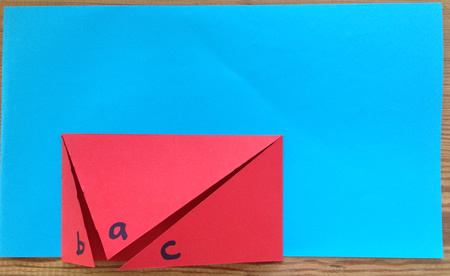 In the second activity, Michael gave out cards with a fraction or percentage on each. Participants had to line up to order their cards. 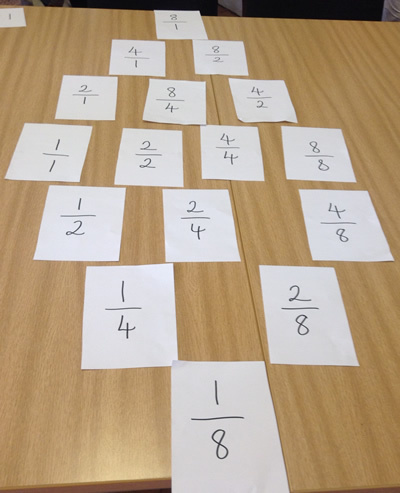 Those participants who didn't have a card were then asked to choose a fraction/percentage between two already on the number line and everyone had to work out what their fraction/percentage was through questioning. We welcomed some new participants today and also Lynne McClure, the Director of NRICH, who led the day, which was entitled 'Embedding The Three Aims of the New National Curriculum'. See Lynne's PowerPoint slides, linked above. 2. 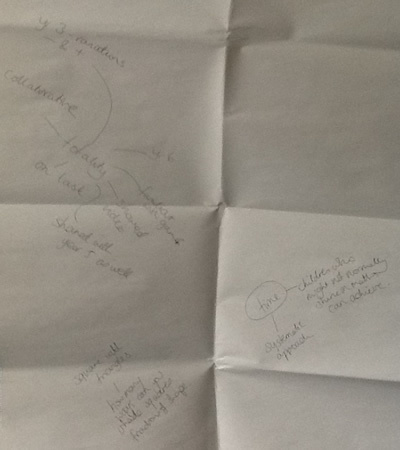 Collaborative - this could then become a 'simmering' activity which goes on beyond the length of the lesson, which gives a strong message that maths doesn't just take place in lesson-sized chunks and models the behaviour of mathematicians. We talked about tweaking the number line to include multiples of ten, decimals, fractions, negative numbers etc. Lynne outlined some relevant research and the idea that children need to have both procedural fluency and conceptual fluency. 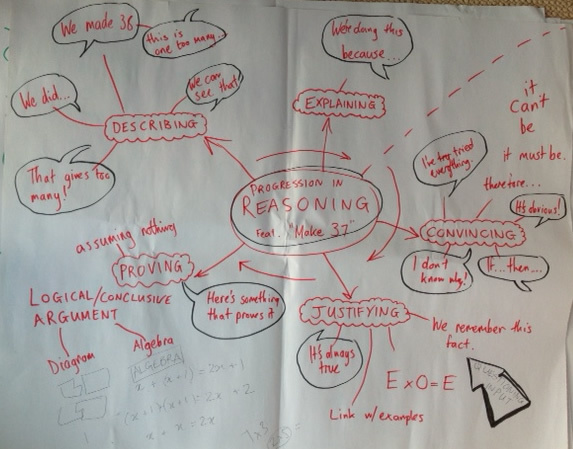 Lynne summarised two types of reasoning - inductive and deductive (see her ppt above for details). Lynne then challenged us with Amy's Dominoes, some groups were allowed to keep the dominoes, some had to return them to the bag. 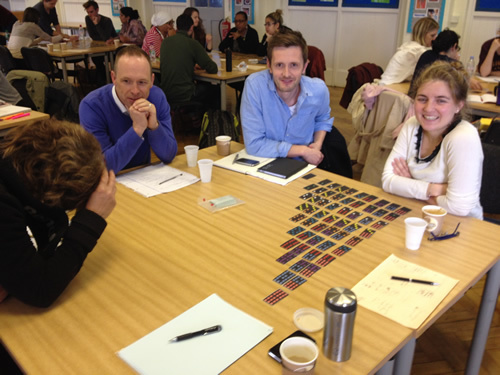 We discussed how important the initial 'playing around' with the dominoes had been before tackling this task and the implications on how we allow children to choose structured apparatus in the classroom. Lynne mentioned Ruthven's research: Exploration > Codification > Consolidation (see Day 2 details above for more info). Lynne introduced us to sets of houses (used in Guess the Houses) and again, asked whether we thought we had a full set. 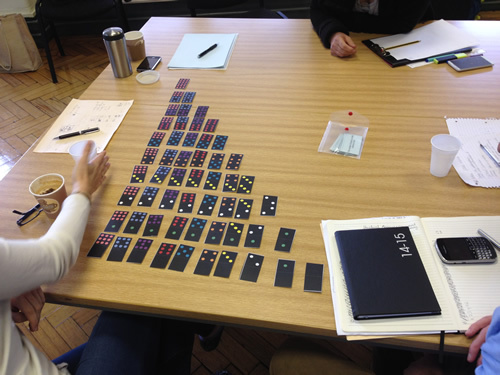 We used the domino sets to have a go at Guess the Dominoes, a group task, and talked about the ways you could make this more accessible (see teachers' resources section of the activity). Session 3 was a split session, with Liz leading an information gathering session for the majority of participants (see PowerPoint linked at top of this section 'HaringeyDay5'), and Lynne leading a session with the Haringey Maths Working Party. We discussed how an element of strategy always increases the level of thinking required and sometimes if the mathematical content of a game is low, it can free children up to reason in a more sophisticated way. 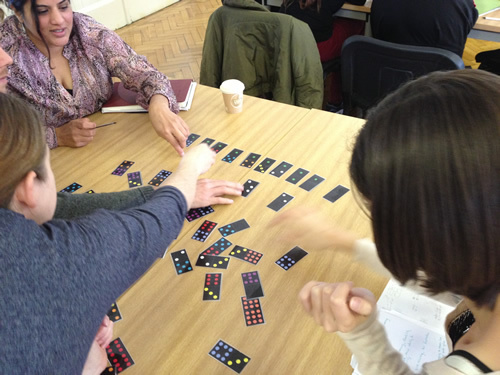 Lynne drew attention to the fact that these games have huge potential and can be returned to again and again, rather than being 'one-off' activities in the classroom. - Those of you who have been with us since January, please email Michael (copied into this message) with the average point score of your last year's class, plus the average point score of a class in that same year group the previous academic year. This is urgent! Please email Michael by next Tuesday (21st). - Please try out at least one of the tasks we had a go at on Thursday with your class and be prepared to share your experiences next time we meet. - Please ask all the pupils in your current class to complete the PupilQuestionnaire and bring the copies with you next time. - Those of you new to the project and who have already been given a copy of the 'Mathematics for Primary and Early Years' book, please have a go at the assessment in the back and bring your score with you next time (assuming each part of a question is worth one 'point'). Michael started the day by sharing some of the data collected through the project so far - see ppt file above. He thanked everyone for their high quality participation which had resulted in such impressive achievements already. Michael led a brief 'people maths' activity, asking one person to come to the front to represent a dot, a second person then represented a line being drawn. How do we make this 2D? 3D? We discussed the open nature of this line of questioning. Some children may find that rather daunting at first so you could have cut-out squares for them to use on a grid. 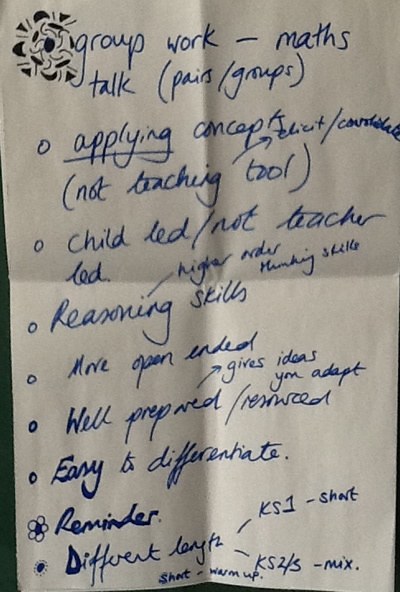 However, the openness gives learners ownership of the task/s, involves them and encourages them to visualise. The activity necessitates thinking relationally about coordinates (i.e. how does this pair of coordinates relate to that one? ), which can lead to generality. Michael suggested that 'geometry' is about the relationship between things whereas 'shape and space' tends to be thought of as labels for shapes. we found it difficult - we drew a triangle first, then found the area, then put in the coordinates. Through explicitly and repeatedly providing children with opportunities to develop key problem-solving skills. Liz shared NRICH's thinking about the four stages of the problem-solving process (see Jennie's article and/or ppt above), and we considered what we might observe children doing at each of the stages in the context of Poly Plug Rectangles. 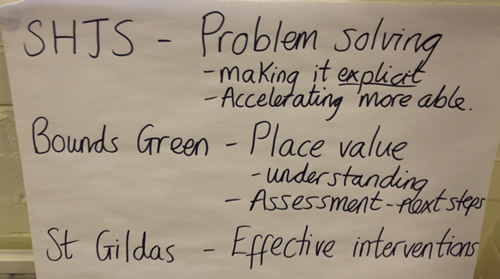 We discussed the problem-solving skills we had used to tackle the task and how we might make sure, as a school, that children have experience of all the main skills. 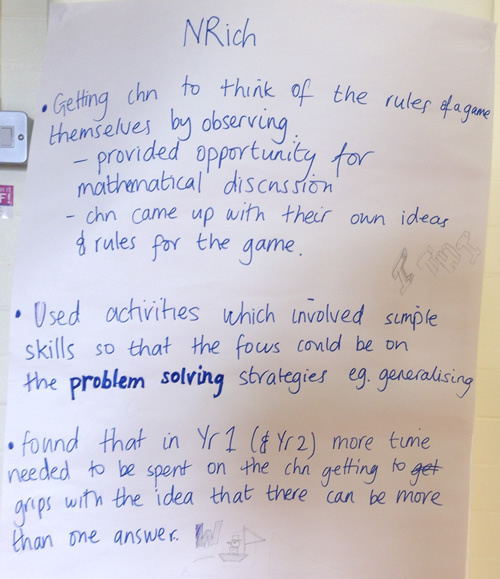 Liz drew attention to the fact that of course this task also offers opportunities to develop reasoning and fluency, the focus of the other two aims of the new NC (in conjunction with problem solving). The fluency is interesting here as it is not number/calculation focused. Liz showed the Teachers' Resources section of Poly Plug Rectangles, which includes some video of Lynne and Liz working on the problem with a class of Year 2 children. Liz reminded everyone of the Problem Solving Feature and the curriculum mapping documents on the NRICH site. Session 4 began with some people maths. Michael invited everyone to make a rectangle. He asked, "What size rectangle have you made?" [6 by 10 with two people forming each corner]; "How many people are there?" and "How do you know?". We numbered round to check the total. Then "Who's in the corner?". Michael was surprised at this outcome as he did not expect two teachers in each corner of their rectangle. With one teacher in each corner, the perimeter would have been 36 teacher units with only 32 teachers in the room. The conflict being that the corner teachers are counted twice. By putting two teachers in each corner the group seemed to have anticipated this conflict! Then, Michael asked everyone to make a rectangle where we were all the rows and columns too. (At this point there were 33 participants.) Then the challenge was to make another one, which we did by turning to face a different direction. 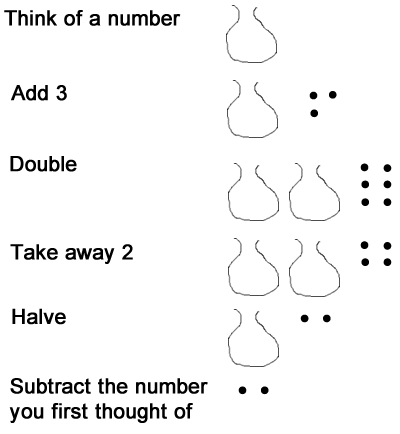 This is a great representation of an array and in particular of 33 being both 11x3 and 3x11. Picture a 3x5 rectangle. What's its area? What's its perimeter? (Michael then showed one made from large squares.) Now remove 1 square from the border. What's the area now? What's the perimeter? Michael encouraged us to articulate why the area/perimeter had changed or had remained the same. Can we take any other squares away and keep the perimeter the same? And now? And now? Using geostrips, Michael created a rectangle and then 'slid' the sides to create a parallelogram. He asked what's the same, what's different? He did a similar thing to a square, creating a rhombus. 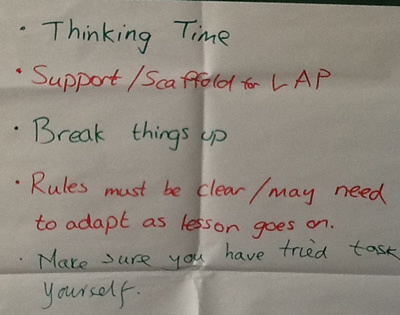 Session 5 allowed participants to plan for work back in school and to discuss running a staff meeting with colleagues. Liz reminded participants about the wealth of articles on the NRICH site which help planning for progression in various topics. They can be accessed via past features or past monthly issues or via our list of CPD articles for the classroom. 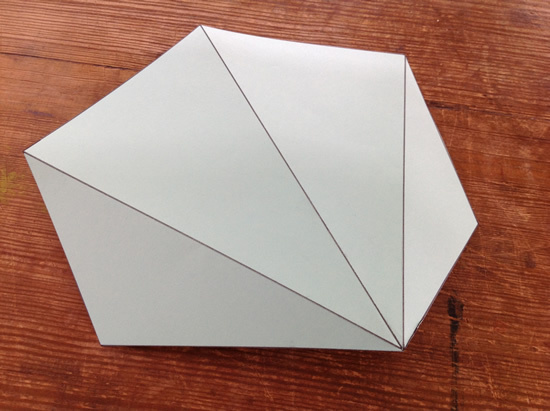 Imagine a large equilateral triangle in your head. Paint the triangle using white paint. You have three smaller triangles which are all black. Pick up one, place it in one of the three corners. Pick up a second one and place it in one of the other two corners. 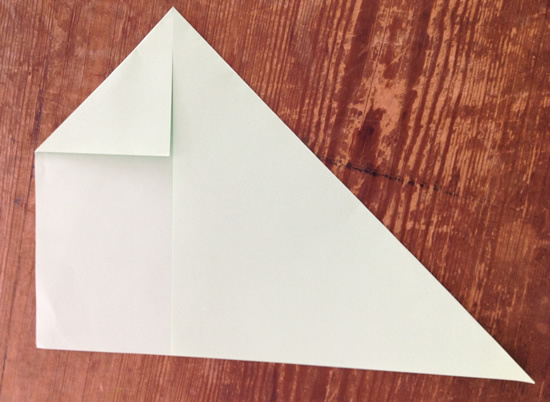 Finally, place the third triangle in the last corner. What is the white shape? What do you see? This ppt presentation includes these ideas. We chatted about how we felt about this visualisation and the conversations led to talking about 'upsidedown' triangles! Michael made an equilateral triangle out of geostrips and we discussed the fact that a triangle is rigid so can't be 'slid'. This has applications in the construction industry. He asked everyone to picture a cube and put a dab of paint on one vertex. 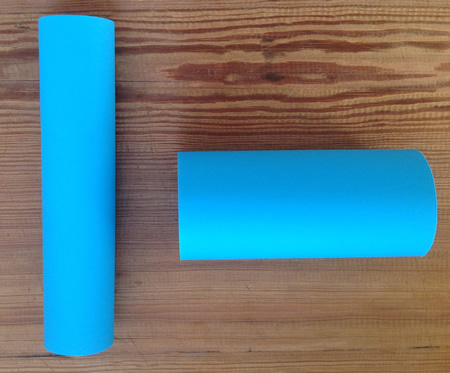 How many edges have got paint at one end? Go to the other end of one of these edges and put another blob of paint on that vertex. How many edges have paint at one end now? How many edges don't have any paint at either end? We spent a short time considering how we know that the angles of a triangle add up to 180$^\circ$. Michael asked all participants to bring back next time ways of exploring this with children. We discussed how triangles drawn on the surface of a sphere do not have angles that total 180$^\circ$. One participant gave the example of two lines of longitude meeting at the north pole at 90$^\circ$ but also crossing the equator at 90$^\circ$. At the very end of the day, Liz showed this presentation which loops round. Here are some notes about it, written by its author. For further ideas, see Geoff Faux's article in the ATM journal, Mathematics Teaching, edition 205. - Please continue to try rich tasks with your class and be prepared to share your experiences next time we meet. 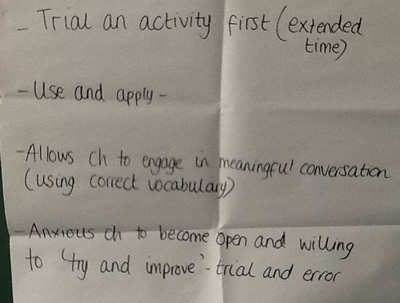 - Plan for a staff meeting in your school, or consider how you will follow up from the staff meeting/s already led. - If you have not already done so, please ask all the pupils in your current class to complete the PupilQuestionnaire and bring the copies with you next time. - Take some time to consider how you might explore the idea that the angles in a triangle add to 180$^\circ$. In the meantime, don't forget there are lots of collections of geometry tasks suitable for Key Stages 1 and 2 if you scroll down the curriculum page of NRICH. This day focused on algebra. 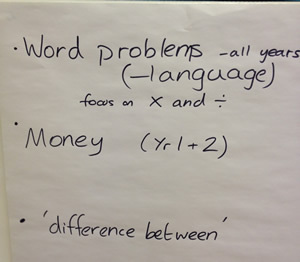 In Session 1, Michael led four different activities to get us thinking about algebra. To begin, he asked us to imagine a drawer of socks which contained only two different types of socks. How many socks would you have to take out of the drawer to be sure of having a pair? How many would you have to take out if there were three different types? Four different types? Five ...? We were able to identify a pattern and express a generality: 'You need to take out one more sock than you have types of socks'. We discussed how this is an example of algebraic thinking. You could use letters to express this thinking, but that might be an end product. Michael suggested we could try finding the diagonal products too. 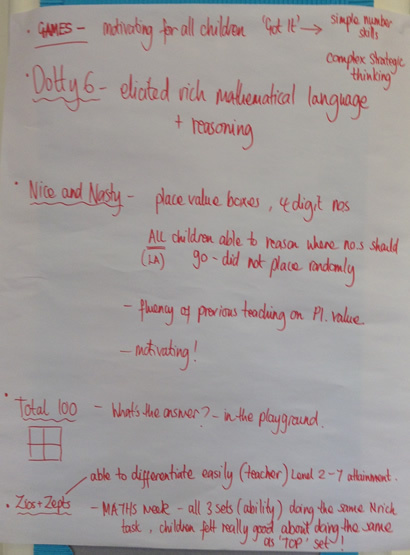 In session 2, Liz led us through a number of NRICH tasks which will help us embed algebraic ideas throughout the primary curriculum, rather than just at Year 6 where algebra is specifically mentioned (see the ppt file linked above). 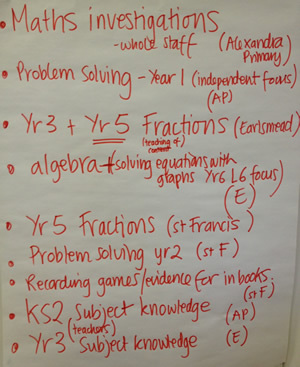 All the activities can be found in the Algebra in the New Curriculum Feature. 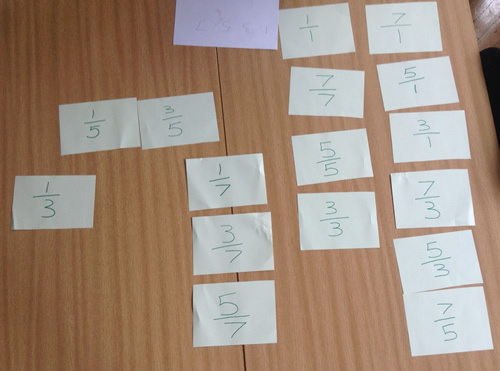 We had a go at Number Balance, which can help learners get to grips with the concept of equivalence and we discussed use of the equals sign, which should not be seen as an instruction ('makes'), but rather as meaning 'equivalent to'. 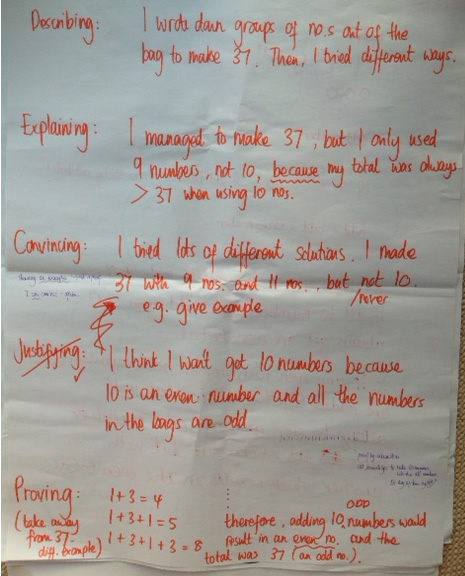 We discussed missing number problems and this led into Heads and Feet, which is an example of such a problem but it also encourages children to represent their mathematics in a whole range of ways. We tackled Shape Times Shape, which can be a good context in which to get children used to the idea of symbols representing numbers. Colour Wheels, Ip Dip and Up and Down Staircases give learners opportunities to identify patterns and then generalise them. 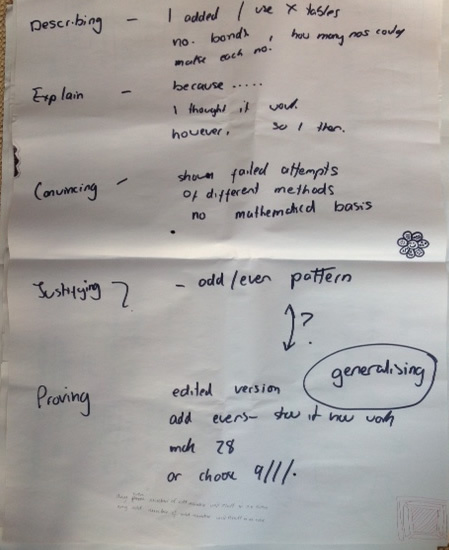 generalising from a number of examples and stating a rule. Used Three Dice, children worked in pairs and needed several attempts to find out that opposite sides of a dice add to 7. NRICH advent calendar was useful for Y6 - they warmed up to problem solving! Books are an issue - pressure to present work beautifully; freedom for children to show their working; designated page/book for recording thoughts/solutions? Children need to be taught meaning of problem-solving strategies. What does visualisation mean? Needs to be explicit. 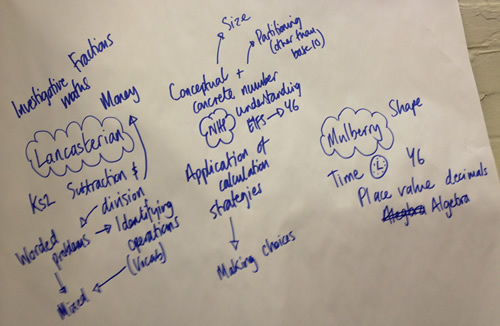 In session 5, we looked in a bit more detail at the National Centre for Excellence in the Teaching of Mathematics website (NCETM), which requires registration. We navigated to the new National Curriculum resource tool and Michael gave an overview of the current Shanghai project, which involves Chinese and English teachers of mathematics spending time in each other's classrooms (see ppt slides for summary and this interim report). NCETM has also published guidance on what makes a high quality Maths textbook. We discussed how this shows that the angles of a triangle add to 180$^\circ$. The first question was ‘what is the same and what is different about the square and the circle?’. This led to discussion about the words 'perimeter' and 'circumference' and to the area of the two shapes - were they the same? One suggestion was that they would not be the same because the use of pi would lead to decimals whereas the area square need only involve whole numbers. - Please continue to try rich tasks with your class and colleagues, and be prepared to share your experiences next time we meet. - Lead a staff meeting in your school, or consider how you will follow up from the staff meeting/s already led. - If you have not already done so, please ask all the pupils in your current class to complete the Pupil Questionnaire and bring the copies with you next time. - If you have not already done so, please have a go at the assessment in the back of the 'Mathematics for Primary and Early Years' book, and bring your score with you next time (assuming each part of a question is worth one 'point'). In addition, you might like to take some time to explore the Algebra Feature on NRICH and the NCETM website. 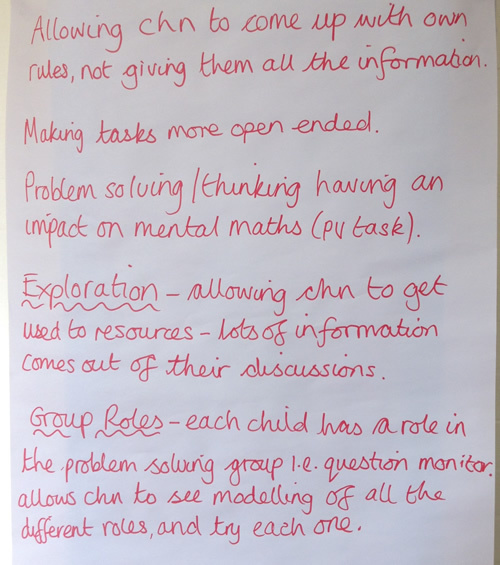 Today's tasks provided opportunties to use mental calculation strategies but we discussed them particularly from the point of view of encouraging children to reason mathematically. - we are drawing on prior knowledge. 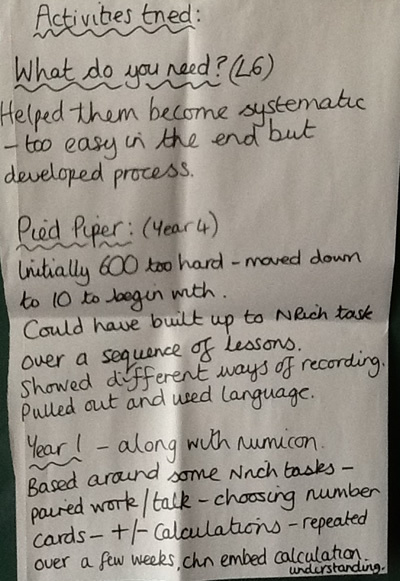 We discussed how to help children get better at reasoning by helping them move through the different stages. 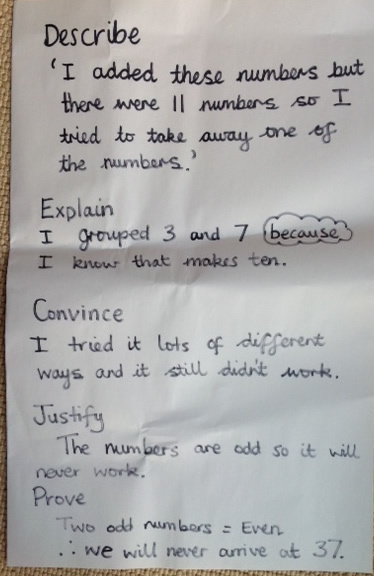 We reflected on the fact that quite often, when asked about their solutions to a task, children describe what they have done rather than offer explanation, let alone convince us, justify or prove. We thought it would be useful to look for the possible generality in tasks so that we can support learners in reasoning at a higher level. The idea of a picture proof (or visual proof, or iconic proof) seemed very powerful in this context and we felt we could use Multilink or Numicon or drawings as above. There is much more detail about the stages of reasoning in the article Reasoning: The Journey from Novice to Expert, which is part of NRICH's Reasoning Feature. However, Michael encouraged everyone to pass on data in whatever format it is available and to also send data for the equivalent class from the previous academic year. After lunch, we had a brief discussion about progress with staff meetings and how the project might be affecting other colleagues beyond the face-to-face participants. Every school was asked to complete this form to summarise the current situation. Following on from planning time, in the final session of the day Michael linked back to day 7 which had focused on algebra. He gave out number cards to some individuals and they had to put themselves in order and describe the pattern. where each term is the sum of the previous two. 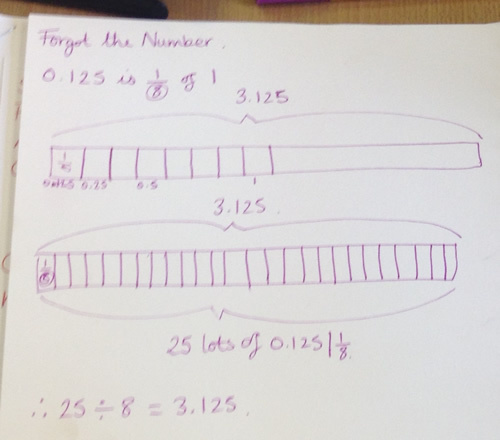 We discussed how we would generate the first sequence and generalised it as 'one less than a multiple of 3' or, as 3n-1 where n is the position of the term in the sequence e.g. the first term = 3x1 - 1 = 2; second term = 3x2 - 1 = 5 etc. 5, -3, 2, -1, 1, 0, 1, 1, 2, 3, 5, 8 etc. etc. We noticed the symmetry around 0. Here the rule would be 'multiply by 10 and add 1'. We tried this out with our names and realised that you always end up with 'Four'. Why? We will follow this up next time. Finally, the last task Michael led invited us to think of four consecutive whole numbers, to find the product of the middle two and the product of the outer two, then find the difference between these two products. We discovered you always get a difference of two. Why? We will also return to this challenge next time. - Lead a staff meeting in your school, or consider how you will follow up from the staff meeting/s already led then please complete this form and return to Michael/Liz. - Bring class data along as soon as you can or send it to Michael. - Take a look at the Reasoning Feature on NRICH. - Have a think about the last two challenges above and come to the session with some explanations and possibly proofs. This day focused on use of calculators. Michael introduced session 1 with a brief round-up of the history of the use of calculators in primary schools. The Calculator Aware Number Curriculum project took place in the eighties and the findings of that project suggested that calculator use didn't 'interfere' with the learning of calculation. The Cockcroft review was very positive about the use of calculators. 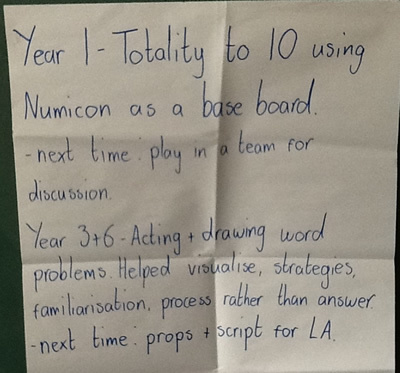 In the National Numeracy Strategy, they were suggested for use in later KS2 for calculating, but also with younger children as an aid to learning mathematical ideas effectively (see this article http://www.tes.co.uk/article.aspx?storycode=331380). On our day, Michael and Liz focused on the use of the calculator in this latter context, to help children understand the structure of mathematics rather than as a tool to perform calculations for them. A similar activity can be done with multiplication as repeated addition by keying in, for example $ 6 + + $ to produce the six times table. If children are encouraged to say the result outloud before they press = it may increase motivation ("say and press"). You can also ask the class to create sequences going backwards, for example, if they start at 72, what would they need to press repeatedly to get down to 6? This links to the fundamental idea of an inverse operation ('undoing'). There was a comment that inputting number sentences (or the reverse of a number sentence given to you) into the calculator may help some chlldren with sequencing. This task produced many solutions to each part and provoked discussion about how it was differentiated easily. 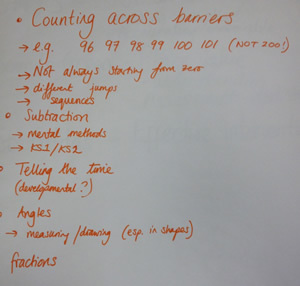 You could ask children to discuss strategies and which calculations are easier/harder. It could also lead into a discussion about which strategy might be most efficient (and what 'efficient' means e.g. as few steps as possible so reducing room for error). We concluded that there are endless possibilities with a broken calculator activity! In the fourth activity, Michael split us into two groups. One group was allowed to use the calculator, the other was not. Michael showed different calcuations in turn (written on large cards) and the first person to shout out the answer won a point for their team. The calculator team always had to key the full calculation into the calculator before answering. This could encourage discussion about when mental methods are more appropriate and when reaching for a calculator is more appropriate. 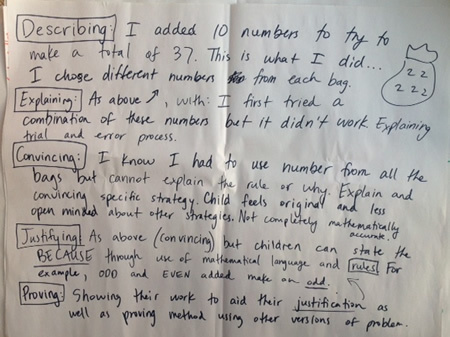 We would hope children ask themselves "what's the best way to do this, given these numbers?" rather than sticking rigidly to a particular method, regardless of the numbers involved. 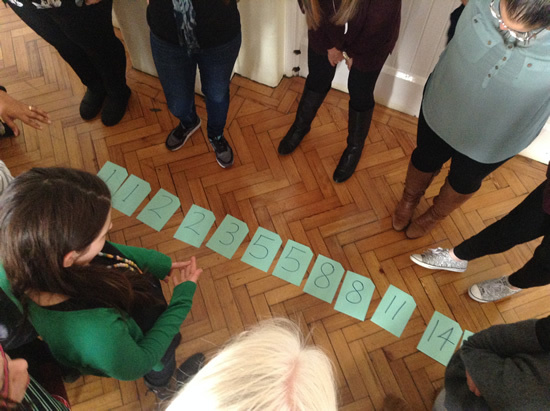 We briefly discussed how giving children lots of opportunities to 'play with' numbers really helps. For example, use the date - what do you know about the number 20? Some children will automtically challenge themselves so that others in the group 'bump into' ideas that they might not have otherwise come across. This could provoke nice discussions about the number of zeros needed! 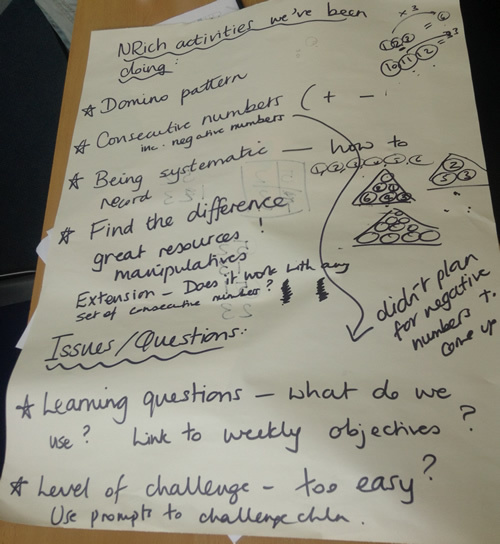 In session 2, Liz shared several examples from NRICH which make use of a calculator to deepen understanding of mathematics (see ppt slides linked above) and we discussed how each task might help meet the aims of the new National Curriculum (problem solving, reasoning and fluency). Secret Number would be a good precursor to Michael's first activity above. It encourages children to make the link between addition and subtraction as inverses of each other (fluency) and offers plenty of opportunities for reasoning - "I knew that your secret number was ... because ...". We tried this out starting with a word of our choice and realised that you always end up with 'Four'. It was suggested this is because 'four' is the only number word which contains the same number of letters as its name. If the lowest number is n, then the other three numbers are n+1, n+2 and n+3. So we know that the difference between the two products will always be 2. To finish off the day, Michael posed two more calculator challenges. In his seventh activity, we were asked to type three digits into the calculator and then the same three digits again, for example 749749. Michael asked us to divide by 7, which surprised us as it produced a whole number for all of us. We then divided that answer by 11, which gave each of us another whole number; then by 13 to give the three-digit number we had started with. We tried to reason why this works ... Again, the idea of inverses was useful in this context. We multiplied 7 x 11 x 13, which gives 1001. Any three-digit number multiplied by 1001 gives a six-digit number with the first three digits repeated. So, if we start with a a six-digit number with the first three digits repeated and divide in turn by 7, 11 and 13, we will return to the three digit number. Finally, the eighth activity involved choosing two numbers on the calculator which are next to each other but not diagonally next to each other. We had to make a two-digit number using those two numbers, and another two-digit number using the same numbers, for example 89 and 98. We were invited to find the difference between our two numbers. By pooling our results, we found that the difference is always a multiple of 9, why? Michael left us with the challenge of investigating what happens if you choose diagonally adjacent numbers. - Please complete the subject audit in the back of the 'Mathematics for Primary and Early Years: Developing Subject Knowledge' book by Heather Cooke (for the second time) and bring your score (count subsections of questions as being worth one mark each). - Please come prepared to talk about a 'significant moment' for you during the project. We will endeavour to capture these through video/audio recordings so if you have a tablet/smart phone which you don't minding using for that purpose please bring it too. - Have a think about the two challenges above (third and eighth activities) and come to the session with some explanations and possibly proofs. 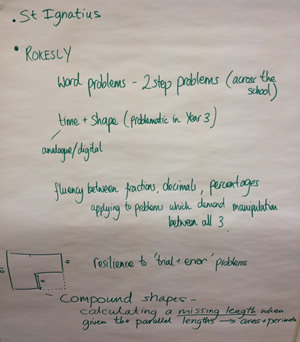 On the last day of the project we focused in general terms on embedding problem solving in the primary maths curriculum, drawing on content from the previous nine days. Liz and Michael gave out copies of this document which summarises the topics we have looked at over the course of the project as a whole. 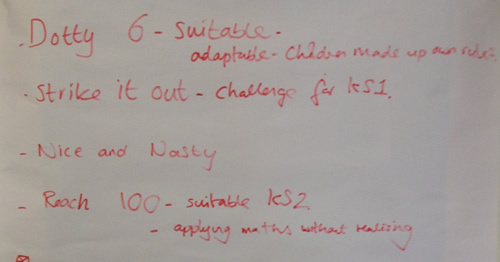 We had a go at Five Steps to 50 and considered what made it a rich mathematical task, the problem-solving skills we used, how we could use it in the classroom, what the lesson objectives might be, how we might structure the lesson as well as what children might record and for what purpose. 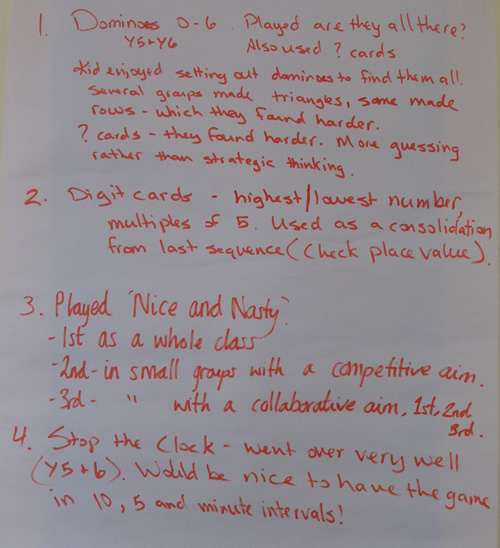 We also had a few games of Dicey Operations (adapted so that we were adding two two-digit numbers to get as close as possible to 100 - see ppt slides) and discussed the reasoning it might elicit. 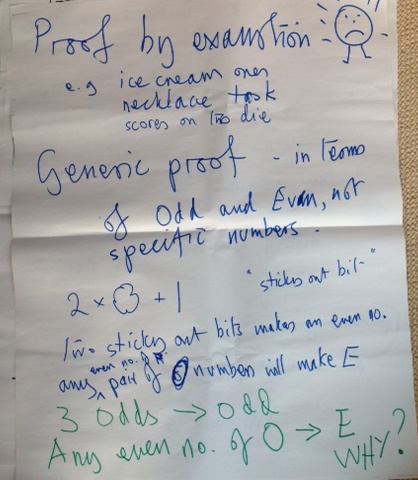 We reminded ourselves of NRICH's suggested progression in reasoning (see day 8) and then tweaked Dicey Operations so that we threw the dice four times before placing any digits and considered how we could prove that our arrangement produced the arrangement which was indeed closest to 100. 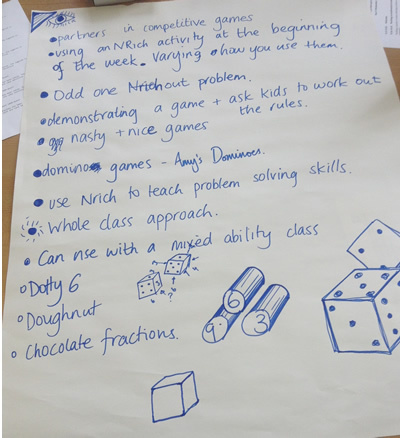 Again, we discussed Dicey Operations generally in terms of the problem-solving skills used, structuring it in the classroom etc as with Five Steps to 50. 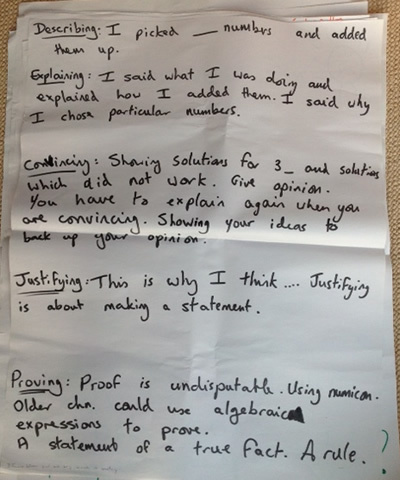 To end the first session, we had a go at Reasoned Rounding, and again discussed the task in terms of problem-solving skills used, structuring it in the classroom etc as with Five Steps to 50 and Dicey Operations. 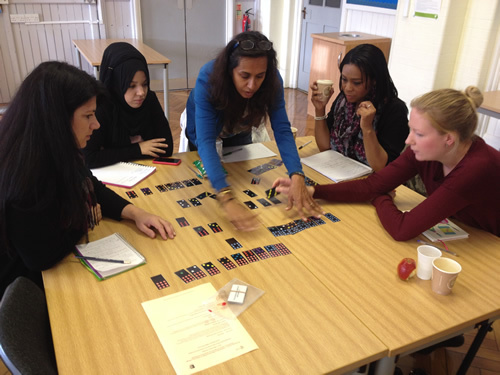 In session 2, participants had chance to reflect on 'significant moments' during the project. These were recorded either in an audio/video format or in a Word document. Please send any further contributions to Michael and Liz. 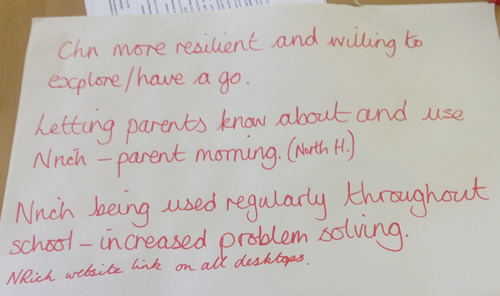 Participants from one school described how their headteacher has been persuaded to integrate a problem-solving approach into maths teaching across the school from September, given the attainment data of the Year 1 classes, which have been trialling this approach through our project. 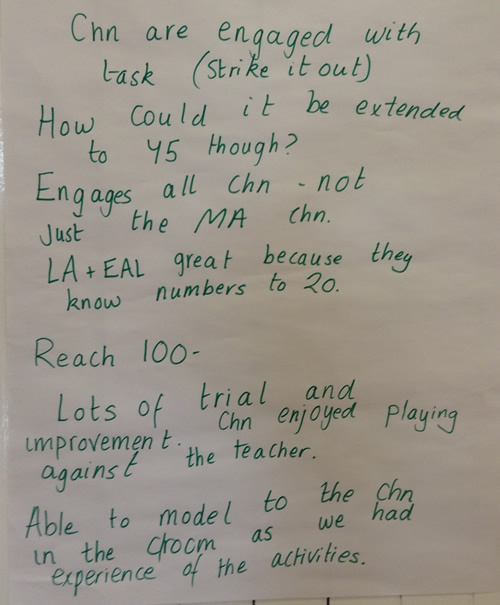 They also described a trial with Year 3 in conjunction with the maths subject leader, whereby for one half term, all maths was problem solving and no particular 'content knowledge' teaching sequences were planned, unless the need arose from a task. This teacher described the transformation in the children, who became much more resilient and confident learners of mathematics as a result. - updated information about staff meeting/other CPD led in/beyond school. This produced some perhaps surprising results! Michael then returned to the eighth challenge he had posed last time, namely choosing two numbers on the calculator and creating two two-digit numbers from them, then finding their difference. For example, if I chose 5 and 6, the two two-digit numbers would be 56 and 65. Their difference is 9. Or, for 6 and 4, we end up with 64-46=18. So the 9 tells us it will be a multiple of 9 and the (a - b) tells us which multiple of 9. 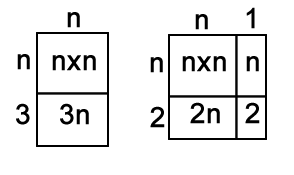 This means that the difference between the two two-digit numbers is 9 times the difference between the two digits! At the end of the day, Michael and Liz thanked all participants for their commitment to the project as a whole. We looked forward to the conference on October 13, which will celebrate the project's achievements and begin to unpick some ideas associated with mastering mathematics in the context of problem solving. This conference aimed to celebrate the achivements of our five-term project and to look forward to the Leadership project which Michael and Liz will be running in 2015-16 in Haringey, within the context of 'mastery'. 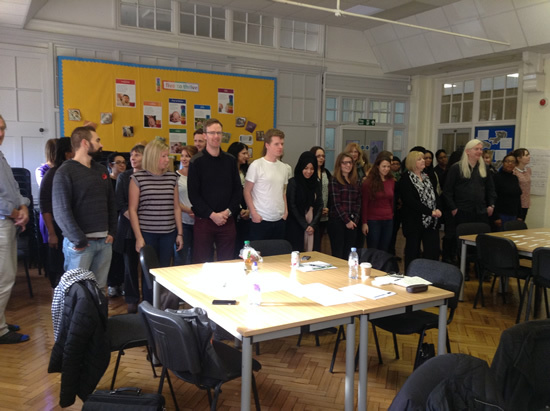 The day comprised two keynotes, led by Professor MIke Askew and Lynne McClure, along with three workshops run by Haringey teachers, Michael and Liz. For more information about the day, please see this summary.